You know what I’m talking about. The deep dark corner of your mind where all your worst-case scenarios replay over and over. 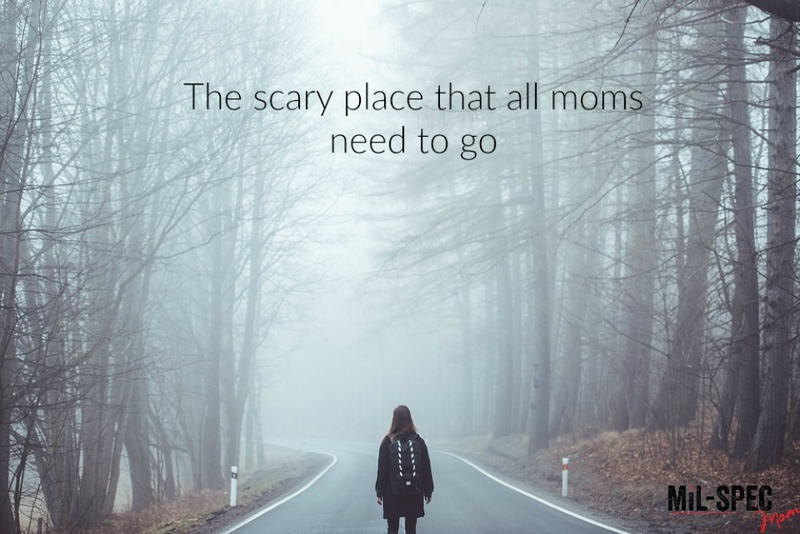 We try to stay away from that scary place whenever necessary, but there are times when us mommy’s need to go to that scary place and hang out for a while. You see, self-defense is a complex beast. It is lifestyle dependent and situational dependent. There are moments when we have to ask, “what is the worst thing that could possibly happen?” and make decisions on how to best protect our families based on this information. If we can plan for the worst case, then making it through the day-to-day hiccups is a piece of cake. Going to the scary place is just that; it’s scary! It’s uncomfortable thinking of those worst-case scenarios that might happen with and to our children. We are forced to dwell in the place that makes us cringe. We are forced to live in that moment where we (hypothetically) get the phone call that makes our heart stop. As scary, uncomfortable, and heart-wrenching as it is, it’s necessary. However, to give you courage, it’s not real! We are speaking completely hypothetically here and we are doing this so we can better protect our children! Our anxiety and fear are worth it. It’s worth it to dive into that place of fear and figure out a way that that scenario won’t happen in real life. But, if it does, you’ll know exactly how to handle that! It’s not real: this is an exercise in preparedness and situational awareness. You’re doing this to save the lives of your children: this exercise can help you find many potential threats. You don’t have to go here often: If you have a routine life, with a consistent schedule, you shouldn’t need to spend a lot of time in the scary place. Each location has a scary place: find the top 3 or 4 places that you spend a lot of time. Think of the top 3 worst-case scenarios per location. Find solutions to those top 3 scenarios for each location. This is what my inner dialogue looks like. It’s a check and balance of my fears to the logical interpretation of the situation. We know, that as women, our fears can be illogical and extreme at times. I think this is what makes us such fierce mamas, though! This illogical fear helps us to protect our children all the better. Check out this link of cultivating your inner fear and turning it into a MAMA BEAR. Go slowly and carefully into the scary place. You might find a notebook and write this process down! It might help you find the clarity you need to navigate your way through and find yourself on the other side of this journey less fearful and more confident in your ability to protect your children.